Anyone interested in the contemporary bouldering scene has heard of Carlo Traversi. 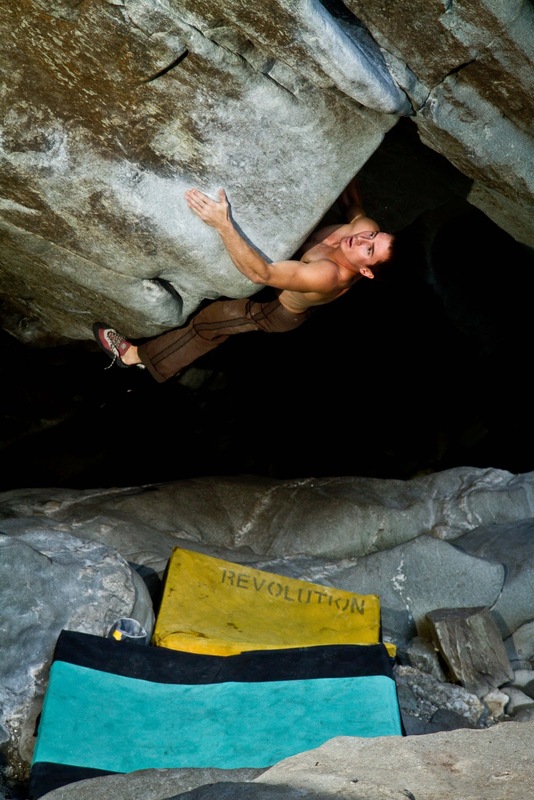 His repeat of Jade (V14) in 2010 put him on the map nationally though a 2008 ground-up ascent of Evilution was certainly an indication of things to come. In 2011, his second ascent of the Game (V15) firmly put him in the nation’s roster of elite climbers. Currently residing in Boulder, Carlo is head route-setter at the Spot Gym. Carlo is also a route climber with ascents of 5.14s at Rifle as well as a voyage up Ariana, the classic high-altitude 12a on the Diamond. Carlo reviewed my book for Rock and Ice late last year and mentioned in that review that the book “lacked the more advanced philosophies of using momentum that could make it more useful to advanced climbers looking to join the world of the elite.” Since I see Carlo all the time at the Spot, I took a few minutes to talk with him about what that meant to him and share with my readers what he had to say. For me one of the great things about bouldering is the focus on analysis and self-reflection and learning from both experience and observation. Since my bouldering is always a work in progress, my thinking and writing about it is as well. Looking over this interview, I hope readers will take away the central point that better climbing is not necessarily the result of application of technique or strength training but of better understanding of one’s own body and its adaptation to the challenges of difficult movement. Attitude and psychology are at least as important as physical strength. PB: Carlo, (in your review of my book) you said something along the lines of, there seemed to be another set of principles or ideas, whether related to movement or training, to get to what might be described as an elite level of bouldering. Could you describe what you think an elite level of bouldering is and what those ideas and principles are? CT: I guess they aren’t really set-in- stone principles at this point. I would more or less call them theory. The way I see it is that looking at elite boulderers, they’ve defined their own styles and have excelled in those styles separately. What has defined the stronger boulderers in the world is that each has a very definite and distinct style and they have perfected that style to a certain extent, beyond what anyone else has. PB: By elite, first of all, you mean what level are we operating at? V14 and up? CT: I wouldn’t even necessarily call it a grade thing. I would categorize those people based on their ability to define their own style and progress within it, and climb very hard in that way. Obviously, Ty has a certain style, Daniel has a certain style, Paul has a certain style, Fred Nicole has a very certain style, Dave has a style, Nalle, Adam Ondra. I would categorize them as some of the world’s best boulderers and they very much have their own, when they climb it has certain look, a flow. They have a certain way of doing things that makes them distinct from one another. They have learned their body well enough to be able to progress within that style, doing the same climbs, but in different ways, making it look different. When I felt like I began to enter into that world is when I started to really understand my own particular style, apart from anyone else’s. I would think, “Yeah someone else might have done it this way, but I really need to start just understanding me and how I interact with rock differently from anyone else.” We’re not going to do it all the same. I think that kind of understanding pushes you further into that elite world. PB: What you seem to be saying is that if you want to get a lot better as a boulderer, it’s not just applying obvious techniques. That will only get you so far. It’s that you need to know how you’re going to fit, not just with the holds, but with the positions and movements between the holds and even an overall feel for the problem from beginning to end. CT: It’s very much an awareness of your own body and I’ve only seen that awareness at a really high level among the people we would consider to be elite boulderers. They have a very good understanding of how to do things in their own way. That’s what sets them apart. That’s not something that’s trained or taught. That’s something that’s learned. It’s learned through practice and experience and yes you’re applying the same techniques as everyone else but you start applying them differently and you start deciphering them in your own ways. PB: What do you think about the emphasis a lot of boulderers seem to have on physical training, whether it’s fingerboards or weighted pull-ups or other things like that? CT: I think it’s helpful for sure. Your ability to hold onto small stuff or bad holds can be trained. Your body can be trained that way but there are people such as Dave Graham who isn’t physically that strong and he knows it, and he says it all the time, that physically he’s not that strong a climber. But he does have strong fingers and he knows how to maneuver his body around holds. Dave doesn’t engage holds, he moves around them almost, from what I’ve seen. He doesn’t just pull on stuff, he grabs it and negotiates his body around it. Rather than just pulling onto it head-on. It’s very different and very much his own thing. I’m not as long as he is. I don’t have as many options for where to put my feet or where to maneuver my body compared to Dave so I have to rely more on physical strength because I am a little bit shorter. It doesn’t make me a better climber or a stronger climber. It just makes my style different. I think the emphasis on physical training is key but it depends on your body type. In some ways it helps but it’s not always necessary because your understanding, specifically of natural rock, is going to be different. It’s not going to rely as much on training in the gym or training on a fingerboard because you’re not going to find a wooden rung outside that you will be campusing on. You going to find holds that you’re going to have to figure out how to grab the right way and move your body around on. PB: The thing that I have noticed working on harder and harder problems, say in the Park, is that although there are small sharp crimps, there are more often holds that are a little bit sloping or hard to grab or good to grab in only one position that doesn’t relate well to the classical kind of grip. If you were going to give someone advice on what seems to me an intuitive approach, listening to how your body works in a certain situation, what sorts of things would you recommend people pay attention to if they are trying to develop a personal style in climbing? CT: Look at yourself climbing. I have a ton of video of myself climbing so I can sit back and watch how I do things compared to everyone else. I was able to see my weaknesses and strengths and further develop on those things, knowing what I was strong at and develop my style in that way. I might say, “I can’t do that crazy undercling move by standing up into it, but if there was a hold above it, I am really good at double clutches and stuff like that so maybe I can jump to the upper hold and catch the undercling on the way out.” I start seeing boulder problems from my own perspective, of what can I actually do on this rather than what I should do based on other people. PB: You mentioned the double clutch just now. It seems like momentum plays a large part in how you climb. How do you make the steps toward using momentum better in bouldering? CT: It is, yeah. You have to get to a point where you understand what good technique is and then what I did is start pogoing stuff because I couldn’t reach it. I started trying to find ways to use my body to get there. It was weird because then I there was one comp where the finish move was a backstep opposition move to the jug and I pogoed it and missed the hold because I pogoed too far. In retrospect, I should have stuck with the original technique but I was in the process of learning to pogo and it was very much an obsession of mine and it was during that time that I did that and didn’t really understand that now that I know how to do this pogo technique and use momentum, I need to figure out when is that really useful and when is that just excess motion. It’s like this timeline of experience. If you learn a certain technique your style is going to follow that way but you have to slowly bring yourself back to what you used to do, to good technique, and use it when you need to. 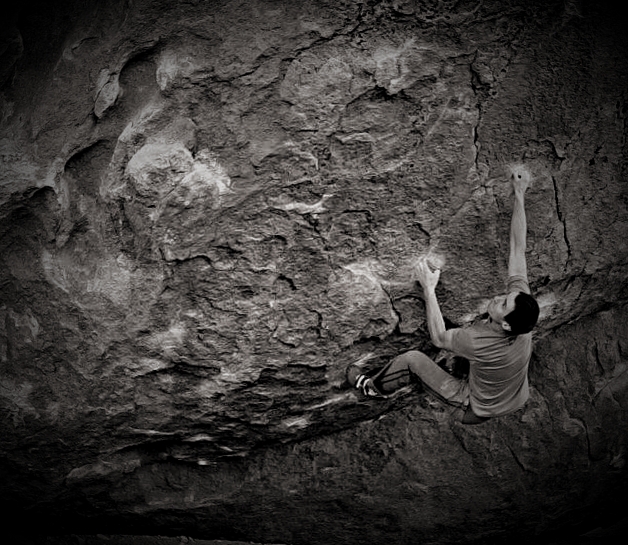 PB: In terms of the future direction of bouldering, kinds of problems moves etc., where do you see things heading? CT: It’s going to be people, the elite boulderers of the world, finding problems in their style and those problems are going to be the hardest things in the world. Each climber is going to push their limits in their own way. I need to find stuff that’s slopey compression with super-dynamic movement. Colorado doesn’t have a lot of that. It tends to be edges and locking off. Ultimately it’s going to end up in sport routes. It has to. In bouldering the holds can only get so far apart and the holds can only get so small for your skin really to be able to hold onto them. Bouldering has definitely not reached its limit. There are lots of hard things to be done, new techniques to be learned, but in the long run it is going to be applying those principles to longer things. PB: Where do you think Colorado bouldering is headed? There has been a lot of development in the pat ten years or so. Has the wave crested? Is there still more out there? CT: I still think there is plenty to go. I know of several five-star projects in the Front Range and the Park that are amazing and could very well be in the V15 range. There aren’t as many strong people here just developing them as there have been. When you have as many strong people as there used to be here with Daniel, Paul, Ty and everyone living here, they were all pushing each other to do it and it was really helpful for everyone. That doesn’t exist right now so it’s slowed down the development of thereally high-end stuff but you still have people out at Lincoln Lake opening V7s and V8s, developing tons of easier stuff. People saw Lincoln Lake as, “Yeah the rock’s not that good but we can create what we want here,” in many ways (laughing), some of which I don’t agree with, but an area was created and people enjoy it and that’s what important. There are plenty of those areas to be developed in Colorado. PB: How about the issue of professionalism in the sport? What’s your feeling on where that’s headed? CT: I think it’s improving. It’s going to come down to companies not wanting to work with people unless they have that professional attitude and interact with the community in a professional manner. It’s slowly coming to that. With Adidas picking up Five Ten and bigger companies start moving in and sponsoring athletes, that’s what they expect and they are not going to settle for anything less. Climbers if they want to get stuff from the community and be sponsored and be a professional athlete, they are going to have to fill that role. That’s what going to dictate it and it’s slowly moving in that direction. It’s hard to tell how fast it’s going to get there because we have seen companies come in and get out after a few years because they didn’t think it was lucrative. The biggest thing I have seen recently is Adidas picking up Five Ten because a purchase like that is pretty serious and can bring a lot of money to our sport. It’s not like, “Hey we’re going to sponsor this athlete for a few years and if we don’t like it, we’re just going to back out.” Instead we’re buying a company that’s climbing-oriented and this company is going to be a part of us and that’s a much bigger deal than picking up an athlete. PB: How about your work with PCI? CT: It’s good. I think the biggest thing that’s coming out of that right now is the clinic series we’re running where we’re going around and teaching a very structured clinic program on technique and how to train power. We’ve done a couple of them. I’ve done one in Dallas and one in Portland Oregon now. They’ve been good. People have been really receptive to them, really psyched. We’ve been trying to run them in the most professional way possible. PB: What about future climbing projects and trips? CT: I’m going to Font in March and maybe Japan in April, Japan mainly for teaching and clinics and interacting with the scene over there. Font because it’s Font and I haven’t been there. PB: Are you going back to Switzerland? CT: The plan is to go to Europe in March and be there for a month or so. If the weather turns bad in Font we’ll go to Switzerland for a bit because it’s not that far. Maybe try some stuff in Swiss. There are some sick projects there. There is some stuff I definitely want to finish there but I might want to wait until next fall to go back fully again. I want to make sure that I am at my peak level. CT: For me Hypnotized would be great. There’s the roof project right below Hypnotized. That thing’s amazing, probably V15 as well. Definitely doable, just really hard. There are a lot of projects, really good ones. There’s that project left of Jade which I think is phenomenal. Between 1000 Shades of Green and Don’t Get Too Greedy. I tried it with Daniel one day and we were only able to do one move on it. It’s definitely the next level for Colorado. It’s awesome, great climbing too. Deadpoint Magazine posted a great review of my book on their website. Please take a moment to check it out. Here's a quote: "The challenge for any author tackling this kind of topic is being able to present massive amounts of potentially stale information in a way that seamlessly incorporates why it is important and why we should keep reading. 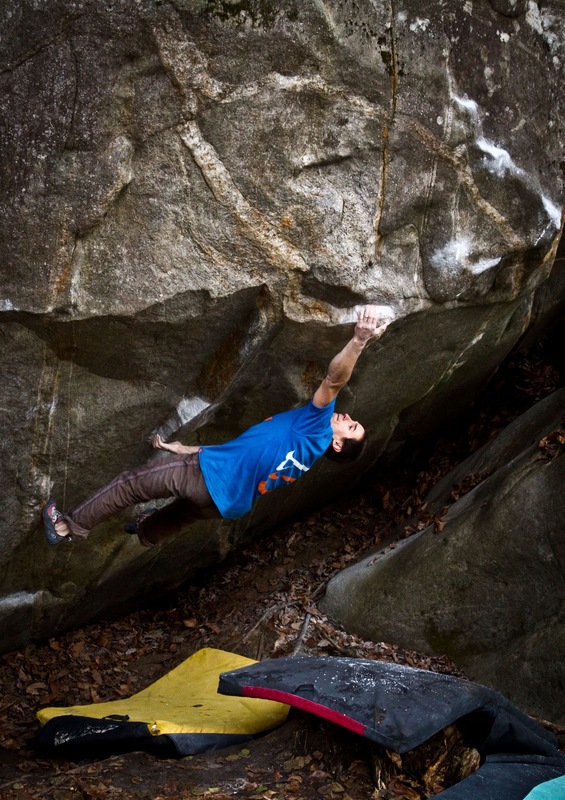 Beal was able to weave together the hard facts, tactics, and movement of bouldering with the reasons that we want to boulder in the first place. 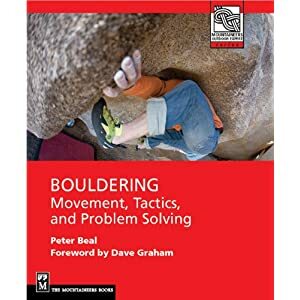 It’s the thoughtful writing style that allows one to continue turning the pages of this comprehensive tome on bouldering, and comprehensive it is." Also I was psyched to see that my friend Andrew Kornylak's film A Fine Line was mentioned by National Geographic Adventure. I did a lot of narration in the film (which I really should review) and NGA featured an excerpt "The Vision of Dave Graham" embedded below. Well worth watching, as is the entire film which is available at HDclimbing videos.com.